| New York, NY - March 26, 2018 | Starting this month, a percentage of revenue from The Chef’s Table at BLACKBARN restaurant will go towards the Heavenly Harvest Foundation, a charity that creates nutritious and quality meals for those in need. Providing the opportunity to watch the restaurant’s renowned chef-owner John Doherty and his team in action and taste five distinct courses made from the season’s freshest ingredients, the Chef’s Table is an unforgettable experience. With a specially crafted menu that changes monthly, the $150 meal includes a selection of five wine pairings to present an affordable journey into New York City’s dining scene. 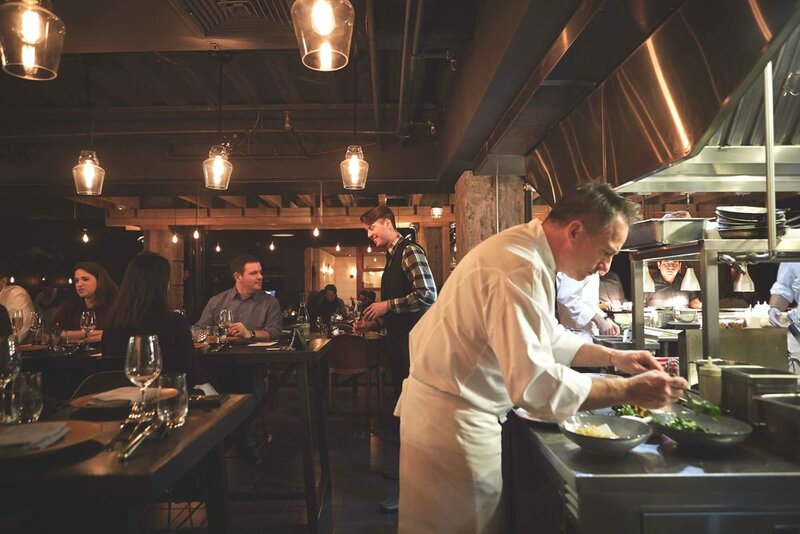 A personal dining experience that invites guests to have a front-row view of the action at long tables overseeing the exposed kitchen, The Chef’s Table offers a performance that is as elegantly simple as the sophisticated dishes Chef Doherty creates. The April menu will feature flavorful and unique combinations like a rich and round foie gras terrine cut with a tangy rhubarb and ginger conserve, and seasonal stars like ramps, white asparagus, fennel, and figs. Reservations for the general public are open for Saturday nights, and available all other nights for private events. To reserve your spot at the Chef’s Table, either call the restaurant at (212) 265-5959 or email at events@blackbarnrestaurant.com. BLACKBARN is a NoMad restaurant serving modern American fare in a rustic barn-inspired setting. Opened by childhood friends Chef John Doherty and Tom Struzzieri in 2015, the design reflects the upscale, farm-to-table menu. After 30 years of experience in the iconic Waldorf Astoria kitchen, the James Beard Award-winning Chef wanted to try his hand at a new type of experience when venturing out on his own. While spending a weekend at Interior Design Hall of Fame recipient Mark Zeff’s, polished, minimalist cabin in East Hampton, he found the aesthetic to match his vision for a restaurant, and opened BLACKBARN under its name with Zeff as the designer. BLACKBARN's Executive Chef, Matteo Bergamini, helms a tight-knit crew that includes Wine Director Andrija Tadejevic, Pâtissier Chef Anwuli Obidi, and General Manager Blake Irving. A weekly Chef’s Table dinner provides a unique and personal dining experience with a five course menu and wine pairings specially curated by Chef Doherty, and a view into the exposed kitchen as he prepares the meal. A portion of all proceeds from these dinners go towards Chef Doherty’s Heavenly Harvest Foundation, a charity that creates nutritious and quality meals for those in need. Chef Doherty and designer Mark Zeff paired again to open BLACKBARN shop, café, and bar at Chelsea Market in late 2017. It provides beautiful homegoods from around the world complemented by Chef Doherty’s dishes and drinks for a curated lifestyle experience.